A boy left his bike up against the tree when he went away to War in 1914 and he never came back. 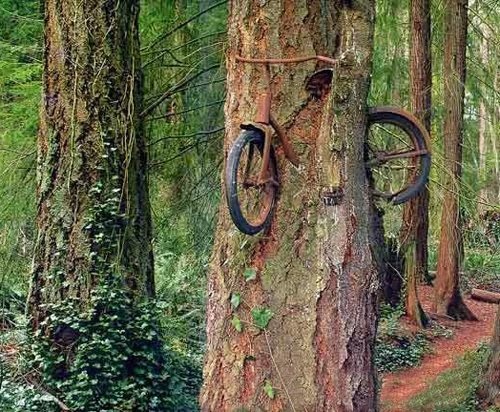 On Vashon Island (near Seattle, Washington), a tree grows carrying a rather unusual passenger - an old bike. 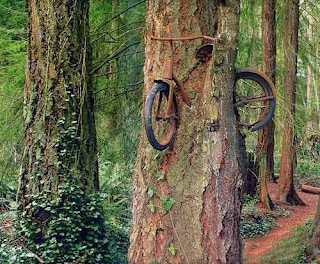 Apparently some kid chained a bike to the tree decades ago and never picked it up, leaving the tree no choice but to grow around the bike. The tree and island gained some level of notoriety when Berkeley Breathed, creator of Bloom County, wrote a children's book inspired by the bicycle eating tree entitled Red Ranger Came Calling.